Oog1, an oocyte-specific gene that encodes a protein of 425 amino acids, is present in five copies on mouse chromosomes 4 and 12. In mouse oocytes, Oog1 mRNA expression begins at embryonic day 15.5 and almost disappears by the late two-cell stage. 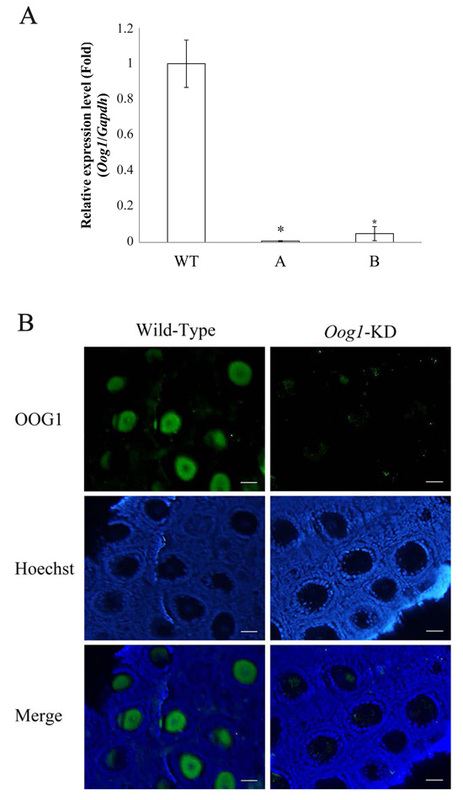 Meanwhile, OOG1 protein is detectable in oocytes in ovarian cysts and disappears by the four-cell stage; the protein is transported to the nucleus in late one-cell to early two-cell stage embryos. In this study, we examined the role of Oog1 during oogenesis in mice. Oog1 RNAi-transgenic mice were generated by expressing double-stranded hairpin Oog1 RNA, which is processed into siRNAs targeting Oog1 mRNA. Quantitative RT-PCR revealed that the amount of Oog1 mRNA was dramatically reduced in oocytes obtained from Oog1-knockdown mice, whereas the abundance of spermatogenesis-associated transcripts (Klhl10, Tekt2, Tdrd6, and Tnp2) was increased in Oog1 knockdown ovaries. Tdrd6 is involved in the formation of the chromatoid body, Tnp2 contributes to the formation of sperm heads, Tekt2 is required for the formation of ciliary and flagellar microtubules, and Klhl10 plays a key role in the elongated sperm differentiation. These results indicate that Oog1 down-regulates the expression of spermatogenesis-associated genes in female germ cells, allowing them to develop normally into oocytes.